This is another photo found in the home of my great aunt, Cecil G Hollingsworth Cook. 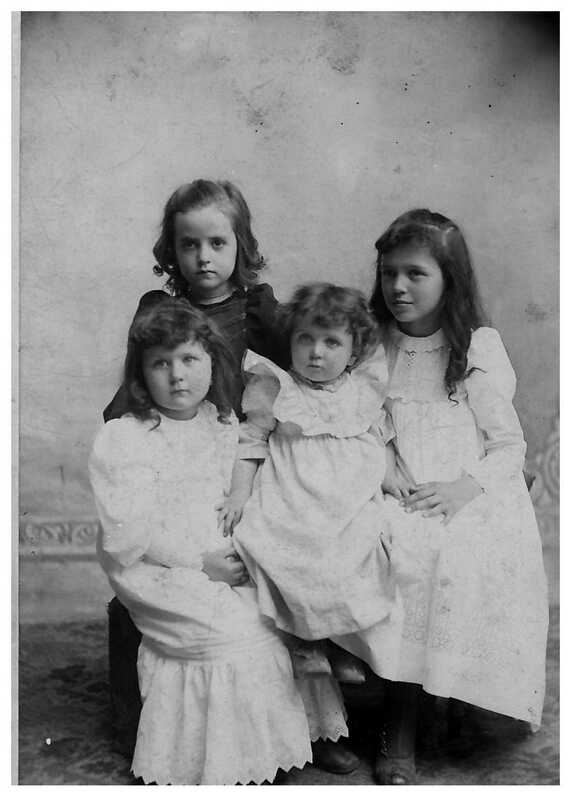 On the back is written: “Cecile, Blanche, Lulu, Zelah.” I believe these children are (L to R); Lula Hollingsworth (seated at left) 1889-1960; Zella Hollingsworth Giles (standing behind Lula) 1888-? ; Cecil Hollingsworth Cook (seated in middle) 1890-1977; and Blanche Hollingsworth Hull (seated at right) 1884-1969. Lula and Cecil were sisters of my grandfather, Victor Earl Hollingsworth 1892-1971, and I have seen many pictures of them. They are daughters of William Harvey (AKA Harvey W) 1864-1950 and Katherine Emma Doyle Hollingsworth 1870-1939. I am less sure about the identification of the other two – I could have them reversed. Blanche Hollingsworth Hull and Zella Hollingsworth Giles were daughters of Joseph Meeks Hollingsworth, the only brother of William Harve. He was born in 1857 and died in 1928. He is buried in the Onarga, Illinois cemetery. He was married at least twice but no wife is buried there with him. I believe that Blanche Hollingsworth Hull’s mother was Maud C Dayton Hollingsworth 1864-1884. She is buried in Gilman, Illinois. From census records it appears that the mother of Zella Hollingsworth Giles was named Margaret and the family lived in Chicago. 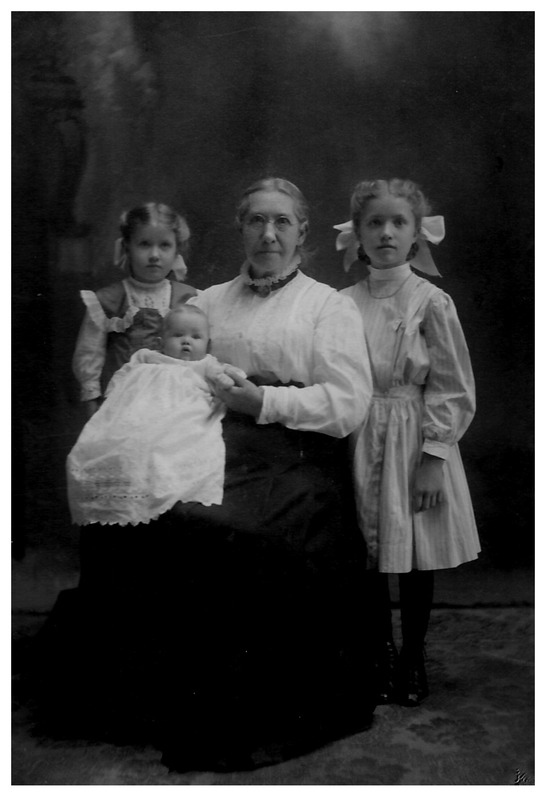 I believe this photo to be of Matilda Walsh (1841-1912) and her grandchildren – two of whom are Mildred B Eversole (c 1901 – ?) and Marion Eversole (1905-1923). Matilda (aka Tildie) was the wife of Richard Walsh (1839-1899) and both are buried in the Woodland Cemetery in Buckley, Illinois. Her daughter was Catherine E Walsh Eversole (1875-1960) who married Hardy A Eversole (1871-1949). 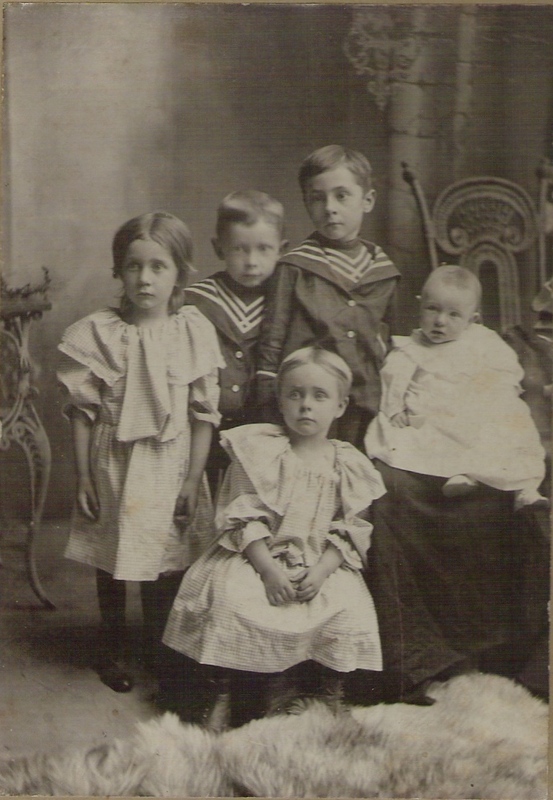 The picture was found in the home of a great aunt of mine and on the back was written “Mrs Walsh & grandchildren – Hardy Eversole children. The puzzling thing is that there are three children and I believe that Hardy had only two. There were also two pictures of Matilda Walsh alone – taken at two different times. I am not – at this time – aware of any familial connection between the Walsh or Eversole family and the Hollingsworth family. They may have been neighbors on the farm. 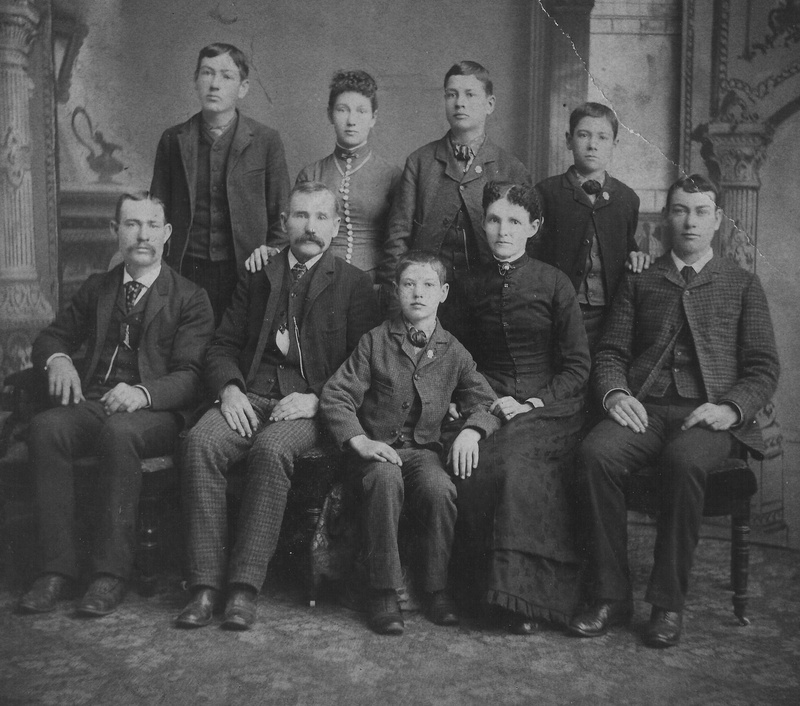 The Walsh family lived in Artesia Township, Iroquois County, Illinois in 1880 and had 7 children in the household at that time – David H 13, Robert C 11, Hanorra 10, Allen E 8, Mary M 6, Catherine E 5 and Alice G 3. I think this was probably a play or skit put together about the organization of the church. 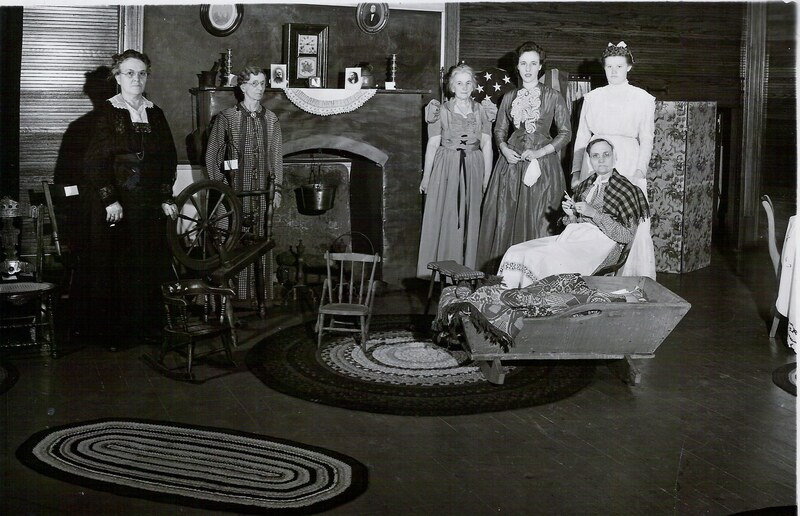 Pictured are: Grace Hildenbrand, Mrs. Foley, Cozette Rice, Margaret Brown, Margaret Martin and Signe Carrington. I have started again to do some serious work on some of my DAR supplemental ancestors. Charles Park (1741-a.1820) is already an established ancestor with service as an overseer/asssessor in Rowan County, NC. But all approved lines go through his son, Charles (1776- c1842) and his wife Mary Quick (1771- c.1840). My line goes through Charles’ sister, Nancy Ann Parks Runyon (1768-1862) to Charles Runyon (1798-1876) to Catherine Runyon Crumerine (c 1827-1863) to Laura Maria (Luary) Crumrine Jimison (1851-1921) to Henry Erle Jimison (1881-1956) my great grandfather. Fortunately, I inherited much of the research that my aunt who passed away in 2010 had accumulated over the years and there was a lot of info on the Runyons in it. The Crumerine name has proven to be a challenge since I’ve seen it spelled at least 5 different ways – Crumrine, Crumerine, Cumerine, Cumrine and Krumrein – but I did locate the family on the Ohio census and an obituary abstract for Catherine so I think I can get this all pulled together shortly. Robert Ellis Lindsay, son of Lloyd Franklin and Dolly Looker Lindsay, was born at Onarga, Illinois, May 8, 1926, and departed this life at the Gilman Community hospital, September 20, 1929, at the age of three years, four months and twelve days. Robert was a child of sunny disposition, and had always been unusually well. He was taken acutely ill Tuesday, September 17, and, though he received all the care that could be given by medical skill and loving hands, he passed away Friday afternoon at 5:30 o’clock. God in His infinite wisdom chooses the most beautiful flowers on earth for His own, just as we in picking a bouquet from our garden select the most promising buds. So he has gone to be a flower in God’s great bouquet of love. Nearly every Sunday since he was three weeks old, Robert had been in the house of God. He attended the Sunday school of the Onarga Christian church and displayed great interest in the teachings, only recently asking his mother how he could see God. Little was it thought that when he was in his place in the Sunday school last Sunday that within a week his question would be answered. Besides the bereaved parents, he leaves to mourn his loss, his grandparents, Mrs. and Mrs. Frank Looker and Mr. and Mrs. E. J. Lindsay of Onarga: three aunts, Mrs. Ellis Hildenbrand of Buckley, Mrs. Kenneth Jackson of Dousman, Wisconsin, and Miss Grace Looker of Onarga; two uncles, Mr. Olin Looker of Watseka and Mr. Lester Lindsay of Onarga. “Beckoning hands of a little one see! Taken so early, is beckoning come. Funeral services were held at the Onarga Presbyterian church Sunday afternoon, September 22, at 2 o’clock, conducted by Rev. Burl H. Candler, pastor of the Onarga Christian church, with Rev. E. W. Wenzel, pastor of the Onarga Presbyterian church, assisting. Sweet music was furnished by Miss Gwendolyn Frazee, who sang a solo, and by a male quartette composed of Archie Fisher, Howard Whiteside, John Eversole and Corliss Jones. Bruce Amerman was at the organ. The Misses Verna Lee, Edith Lee, Nola Clarkson, Lucille Stratton, Ruth Hockersmith, Avanell Richards, Dorothea Bostwick and Norma McGuire assisted in carrying the floral pieces which were numerous and beautiful. Willis Schumers, Virgil Greiner, Ruel Taylor and Raymond Wilson acted as pallbearers. Interment was made in the Onarga cemetery. The out-of-town relatives who were here for the services were Mr. and Mrs. Kenneth Jackson and Mrs. Ethel Thomas of Dousman, Wisconsin; Mr. and Mrs. Charles Koon and family of Watseka; Mrs. Maggie Pease, Mrs. Edith Duff, Mr. and Mrs. Truman Brown, Mr. and Mrs. Jessie Dial, Mrs. Flossie Miller of Gilman; Mrs. Eva Miller of Chicago; Mr. and Mrs. H. E. Wood of Joliet and Mr. and Mrs. E. E. Lindsay of Champaign. Note: My grandfather was Lester Lindsay (1904-1969), an uncle of Robert Ellis Lindsay. My mother was 2 years old at the time of this death. This is a picture (r to l) of Robert, my mother (who is still living) and their grandmother, Olive Myrtle Kindig Lindsay (1875-1956) – probably taken sometime in 1928. Elvira Bradshaw Wiswell Solomon was my 3 gr grandmother through her daughter, Catherine Frances Wiswell Lindsey/Lindsay (Mrs. B. F.). Ellis Lindsey/Lindsay was my great grandfather. Elvira Bradshaw was born near Jacksonville, Ill., Jan 21, 1824. Her girlhood days were spent upon a farm in Morgan county, Ill. She was married to E. M. Wiswell April 7, 1839, and continued to live on the farm until 1852, when they moved to Concord, in Morgan county, and lived there until the close of the civil war. They then removed to New Orleans, where her husband died of yellow fever Oct. 22, 1866. She, with her family came back to Illinois, where she has since lived. To them were born eight children, seven daughters and one son. They are all living and are somewhat scattered. Mrs. E. J. Thistler, living in Burgin, Ky.; Mrs. Josephine Shank, Washington, D. C.; John Wiswell, Greenwood, Mo. ; Mrs. Dr. Austin, Long Beach, Cal. ; Mrs. F. W. Doolittle, Jacksonville, Ill.; Mrs. Thos. Douglass, Palmyra, Ill.; Mrs. B. F. Lindsey, Onarga, Ill., and Mrs. B. H. Skeels, Thawville, Ill. In March, 1879, she was married to A. M. Solomon, of Palmyra, Ill., who survives her, but is quite feeble and not able to attend the funeral. Four years ago she had a paralytic stroke, and for the last year and a half has been entirely helpless. One year ago last July she was brought to the home of her daughter, Mrs. B. H. Skeels in Thawville, Ill., where she peacefully passed away Sunday afternoon, Dec. 30, 1900. She was buried from the family residence Jan. 1, 1901. The remains were interred in the Thawville cemetery. Three grandsons and three great grandsons acted as pall-bearers. Besides her children, she leaves twenty-three grandchildren, fourteen great-grandchildren and two great-great-grandchildren. The two latter are children of C. A. Thrasher, of Thawville. Deceased had been a member of the Christian church since fifteen years of age. Those present from a distance were: Mr. and Mrs. J. S. Doolittle, Chatsworth; Mr. A. J. Bradshaw, a brother of the deceased, Blandinsville, Ill.; Mrs. Thos. Douglass, Palmyra, Ill.; Mrs. Ethel Houghton, Gilman; Misses Blanch and Mabel Lindsey, Champaign; Mrs. B. F. Lindsey, Ira, Ellis and Eddie Lindsey, and Mrs. Caroline and D. Parmelee, Onarga; Mrs. L. G. Thrasher and son Frank and Chipman Skeels, Watseka. Rev. N. W. Atkins officiated and the choir was composed of friends of the family. The singing was beautiful and appropriate. Bro. Atkins read the 90th Psalm and made some beautiful and touching remarks upon mother love and the filial devotion children should show their parents. These are entries in the family bible of John David and Martha E Gish Kindig. The bible was presented to J D Kindig by his father B G (Benjamin Grove) Kindig on 25 Dec 1885. Dexter Dalton was a brother to my 3 gr grandmother, Eveline Dalton Libhart and his wife, Ella, was a half sister to my 2 gr grandmother, Estella Belinda Libhart. 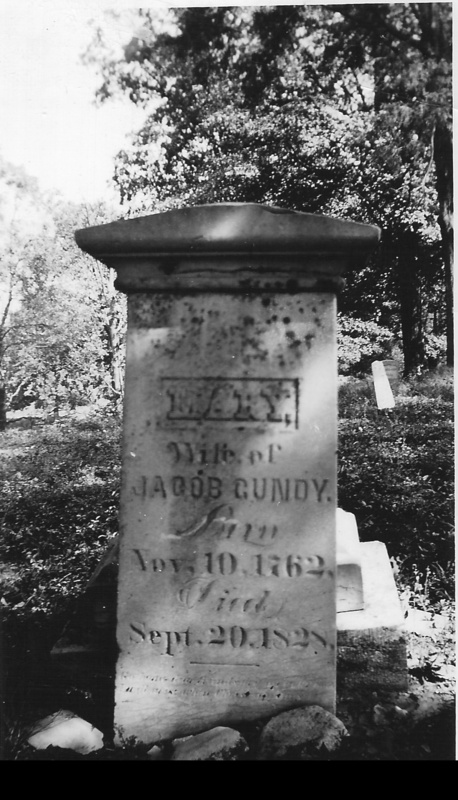 My 5 gr grandmother, Katherine Maria Maury (10 Nov 1762 – 20 Sep 1828) married Revolutionary War Soldier, Jacob Gundy (13 Oct 1765 – 23 Sep 1845), in 1784. After Katherine’s death, Jacob moved to Vermilion Co, IL. This picture was taken in May 1936. This grave is located in the Gundy Cemetery, about 15 miles SW of Columbus & 6 miles from Harrisburg, OH.